The Fresnel light reimagined. 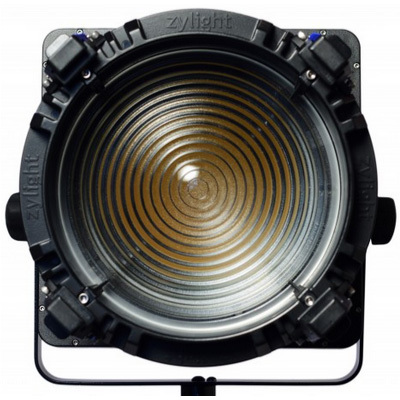 The multiple award-winning F8 LED Fresnel from Zylight is the next generation of Fresnel lights. By incorporating a special blend of Quantum nanoparticles with traditional phosphor the F8 boasts a CRI of 97+ and a quality of light matched only by traditional sunlight and incandescent bulbs, while using a fraction of the energy. All of the hallmarks of a traditional Fresnel light are present: single shadow beam shaping through barn doors, continuous focusing and a smooth light field. The Zylight F8 adds wireless and DMX control, water-resistant IP54 rating, and very rugged construction for field reliability. Available in both 3200K or 5600K colour temperature versions, the Zylight F8 is extremely compact, durable, and the most versatile Fresnel light ever built. The Zylight F8 can be powered by both a worldwide AC power adapter or a standrad 14.4V camera battery for complete portability. Its thin design and shape allow it to pack into small cases and be taken anywhere. The water-resistant IP54 rating ensures the F8 will be comfortable in falling rain or snow and blowing dirt and dust. Whether shooting a stand-up in a hurricane or snow storm, the F8 will deliver bright light with ease. Try that with your traditional LED Fresnel. In the studio, all functionality of the Zylight F8 can be controlled via DMX or remotely via the built-in Zylink wireless link. Local control such as dimming, focus and wireless operation are provided on the rear of the F8. At 15" x 12" x 4" it will take up considerable less space in your grid than its traditional counterpart. The yoke mount allows for easy panning and tilting for quick focusing. The F8's silent operation means it can run in a studio setting without disruption of audio recording or talent distraction. The F8's advanced ultra bright LED module ensures excellent skin tones and rich, accurate colour rendition. Continual focusing and an adjustable beam spread between 16-70 degrees allows for even coverage when shooting with wide-angle lenses or HD 16x9 format. 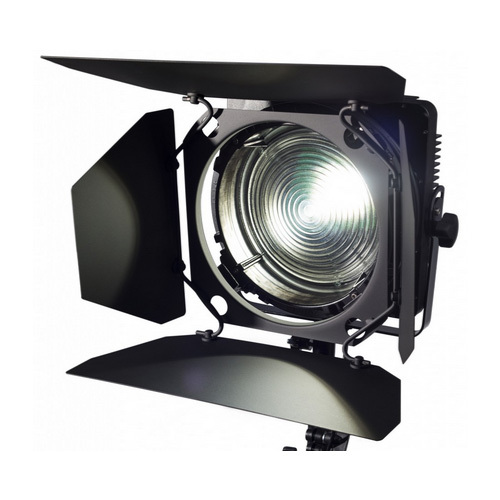 The F8 uses a high quality glass 8" Fresnel lens and has an equivalent output of a traditional 650 watt instrument. Barn Doors, soft box, and other accessories will be available soon. Very Portable. Use it Anywhere! Size 15" x 12.6" x 4.6"